How Long Is the Brooklyn Bridge in Miles and Metres? How Long is the Brooklyn Bridge? In Miles and Metres? QUESTION: How Long is the Brooklyn Bridge? In Miles and Metres? People often wonder how long the Brooklyn Bridge is. Here's the answer, in both miles and metres. Mostly, visitors are curious because they are considering walking or biking across it. If you want to walk or bike the bridge, here's a few tips to make your trip a bit easier. In miles: The Brooklyn Bridge is slightly over 1.1 miles long. In kilometres: The Brooklyn Bridge is about 1.8 kilometres long. When it was built, the Brooklyn Bridge was the longest suspension bridge in the world. Of course miles and kilometers are useful for plotting the time you'll need to cross the bridge, there are other factors when crossing the bridge. You might want to take a leisurely walk or you might want to run across the bridge, which means you will cross the bridge at different times. Walking across the Brooklyn Bridge is a highlight on any trip to Brooklyn. There are many places you'll want to stop to take pictures of the views of lower Manhattan and Brooklyn. The path is quite wide, and there is a designated bike lane, so you'll be able to navigate your way across the bridge fairly easily. There are spots which are perfect for taking pictures. Of course, you will see people congregated at those parts of the bridge, To avoid crowds, try to cross the bridge earlier. At that point, locals run and bike the bridge, but there are less tourists taking pictures. If you want to impress the folks walking across the bridge with you, here's a few quirky facts about the Brooklyn Bridge. Next time you cross the bridge, be sure to impress your companions with this information. Sandhogs built the Brooklyn Bridge. Does the word sandhog evoke images of animals that should reside in Sedona? Well, the sandhogs weren't animals at all, but were people. The term sandhog was a slang word for the workers who built the Brooklyn Bridge. Many of these immigrant workers laid granite and other tasks to complete the Brooklyn Bridge. The bridge was completed in 1883. And who the first person who walked across the bridge? It was Emily Roebling. Elephants walked Across the Brooklyn Bridge. ​P.T Barnum's elephants walked across the Brooklyn Bridge in 1884. The bridge had been opened a year when twenty-one elephants, along with camels and other animals crossed the bridge. Barnum wanted to prove the bridge was safe and also wanted to promote his circus. Falcons nest on the Brooklyn Bridge. According to History.com, there are about 16 pairs of Peregrine Falcons living in New York City and some nest on the Brooklyn Bridge. They also nest in other spots around the city. For more info on the Brooklyn Bridge, here's five things you might want to know about the bridge and Brooklyn's history. 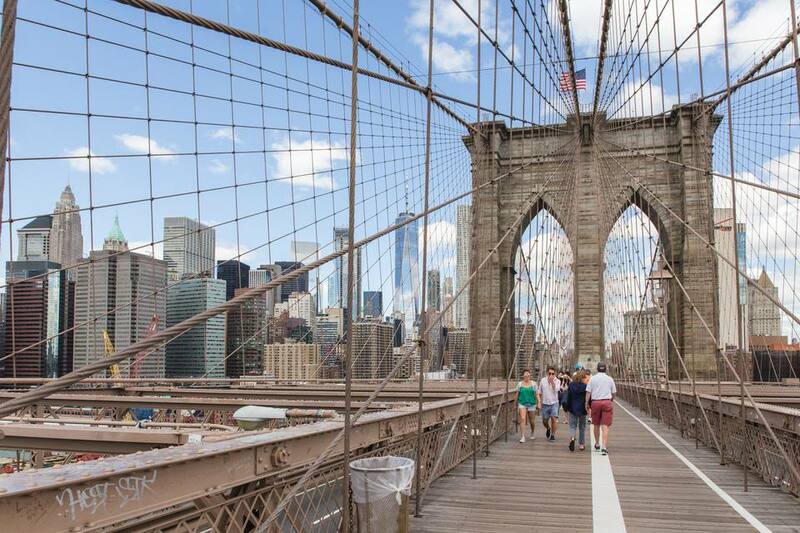 There is much to learn about the history of New York and American history on a simple walk across the Brooklyn Bridge. There are plaques on the bridge with information about the history and the construction of the bridge. What NYC Landmarks Can You See from the Brooklyn Bridge? Which Skyscraper Is It? Empire State Building? Or Chrysler? Bridges Here, There Everywhere: What are the Bridges You See from the Brooklyn Bridge? How Does One Drive Across the Brooklyn Bridge to DUMBO and Brooklyn Heights? So You've Arrived in Brooklyn. Now What? Here are a few tips on what to do after walking from Manhattan to Brooklyn, over the Brooklyn Bridge. How Far is it to Walk to the Brooklyn Botanic Garden from the Brooklyn Bridge? Get more tips and info about visiting Brooklyn.